As a connoisseur of heist films it just doesn’t get any better than The Asphalt Jungle (1950), which also happens to be one of my all-time favorite film noirs. Directed with stylish economy by John Huston, it features atmospheric black and white cinematography courtesy of Harold Rosson (The Wizard of Oz) that draws me into its shadowy world of cops and crooks every time. This is evident from the establishing shot of a police car on the prowl on a deserted city street in an unidentified Midwestern city. We are soon introduced to its target – a tall man dressed in a suit who carefully evades the squad car. Huston sets a fantastic mood early on as we see the man make his way through city streets littered with garbage and grimy back alleys strewn with rubble as Miklos Rozsa’s suspenseful music plays over the soundtrack. The unidentified man reaches his destination – a small diner simply known as “Café.” Without a word, the man hands over his gun to the counterman who stashes it in his cash register just before two cops come in and bust the man for vagrancy. 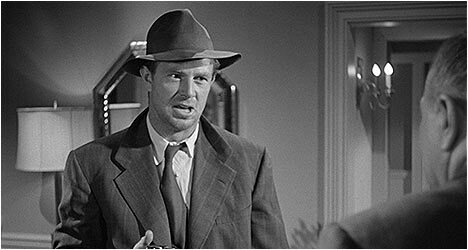 Down at the police station, the man is put in a line-up with two others where he’s finally introduced as Dix Handley (Sterling Hayden) and his rather impressive rap sheet is rattled off. It seems that a man whose place of business was held up the night before is asked by the police to identify the man responsible. He takes a hesitant look at Dix who stares threateningly at him, but in a subtle way (if that’s possible) that clearly intimidates the man. As a result, he refuses to finger Dix for the crime. Lieutenant Ditrich (Barry Kelley) meets with the Police Commissioner (John McIntire) who chastises his subordinate for not doing his job properly and for allowing too much crime to go on in his precinct. To further add to the man’s woes, criminal mastermind “Doc” Riedenschneider (Sam Jaffe) was released from state prison and was spotted heading towards the city. The gruff Commissioner gives Ditrich one more chance to redeem himself. Doc makes his way through the criminal underworld to a joint run by Cobby (Marc Lawrence), a bookie with all kinds of connections. Doc tells him about a job that he is thinking of putting together that will result in a $500,000 payday, but he needs $50,000 in startup money. Through his prison contacts, he heard that Alonzo Emmerich (Louis Calhern), a wealthy lawyer who reeks of smug condescension, could provide that kind of backing and also be able to fence the stolen jewelry. He has pretensions to being a cultured man, but in actuality he’s just as greedy and untrustworthy as any criminal. We soon find out that he’s bankrupt and only projects the illusion of being well-off. Emmerich needs this score as much as any of them. With the start-up money secured, Doc hires three men to pull the job: Louis Ciavelli (Anthony Caruso), an expert safecracker, Gus Minissi (James Whitmore), a driver who helped Dix out at the diner, and, of course, Dix, the requisite muscle. As film noir expert Eddie Muller points out, Huston presents a criminal underworld of “struggling laborers, alienated loners, even honorable family men,” along with the usual assortment of low-lives and corrupt figures. None of them have lofty aspirations – they just want to carve out a better life for themselves. In a nice touch, Huston shows Doc and his crew plying their respective skills by depicting the actual job, which certainly adds to the film’s authenticity. While The Asphalt Jungle certainly didn’t set the world on fire when it was first released, it has proved to be quite influential, spawning a television series of the same name, starring Jack Warden, and also helped kick start the sub-genre of caper films, inspiring the likes of Rififi (1955) and casting a long shadow that would be felt in efforts like Reservoir Dogs (1992) and The Usual Suspects (1995). This Blu-Ray transfer is a definite improvement over DVD versions with excellent details and a sharper image. There is an audio commentary by film historian Drew Caspar and archival recordings of actor James Whitmore. It was an unusual film for MGM to release as they had a reputation for making musicals and family comedies. Caspar puts the film in a historical context with the Hollywood studio system as well. Whitmore talks about how he was cast in the film and what drew him to the project. There is an archival interview with director John Huston who briefly discusses the film. Pharos of Chaos is a revealing 1983 documentary about actor Sterling Hayden. He was a colorful personality to say the least and this is reflected in the film. He espouses his unique personal philosophy in this engrossing doc. Also included is an interview with film noir expert Eddie Muller. He says that The Asphalt Jungle doesn’t condone criminal activity, it accepts it. He calls the film the quintessential crime film and champions writer W.R. Burnett who wrote the novel that the film is based on. Huston loved his books and first adapted High Sierra (1941) and then The Asphalt Jungle. Cinematographer John Bailey talks about the visual look of the film and the distinctive style of Harold Rosson. He praises the man’s range of work that was done mostly for MGM. Bailey analyzes the lighting techniques Rosson employed on the film. An episode of Canadian television show City Lights is included and features Huston talking about his life and work in 1979. The veteran filmmaker is an engaging storyteller and tells all kinds of anecdotes. “The Huston Method” is a collection of audio interviews with Huston where he talks about writing and directing films.